Gallup, NM: Buffalo Medicine Books, 2001. 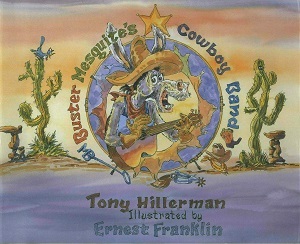 This is an edition of Buster Mesquite's Cowboy Band, which was published by Buffalo Medicine Books in Gallup, New Mexico. This is a children's book featuring a cast of Southwestern animals who start a band. The illustrations in this book are by Ernest Franklin. Franklin illustrated for Hillerman in the past for a few limited edition copies of his Navajo Mysteries. Format: Hardback, 27.5 x 23 cm. Binding: Full-colored boards with a fully illustrated cover and the title and author/illustrator printed vertically on the spine.